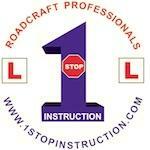 1 Stop Instruction www.1stopinstruction.com Review | DAS 1st time pass!!! Having fell off the bike at least 10 times on cbt, 121 & day 1 & 2 of Das. The person I dealt with was very patient and firm in his teachings. The insight of the other two people I dealt with was great in getting me test ready and confident for mod 2. Could not believe I passed everything 1st time considering how I started. Great school, professional staff and excellent instructors.